Despite the cold weather, it has been another busy week for us all here at Deepdene. Pupils in Years 1, 2 and 4 have enjoyed class trips this week. It is always wonderful to contextualise learning and to bring learning to life. Year 1 enjoyed a visit to the Sea Life Centre on Wednesday to learn more about the underwater world. Year 2 were out at Crawley Fire Station on Thursday morning, as part of their ‘Great Fire of London’ project. They also had a chance to learn more about keeping safe and to learn more about the role of the fire brigade within the community. Today, Year 4 pupils were excited to learn more about the Terrible Tudors at the Theatre Royal in Brighton as they enjoyed a production about the Tudors, put on by Horrible Histories. Please do take a look at the school Facebook page to see some pictures from these trips. Our School Council team also met this week with our Year 6 Head of School Council reps (overseen by Mrs Croucher). They are busy rehearsing and planning a school assembly where, next Thursday, they will share with the school an update on progress made with their recycling initiatives. 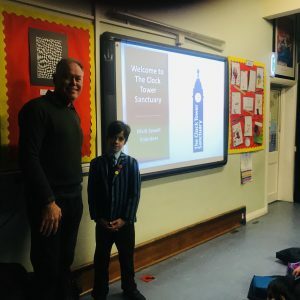 On Thursday Arthur Croucher (Head of Arundel House) arranged for a visiting speaker to come and speak to us about the work of the Clocktower Sanctuary which is the House chosen charity for the year. It was lovely to learn more about the support they provide locally to the young homeless in our City and we were all really interested to hear about the different types of support that the day centre provides. All the pupils listened carefully and asked and answered some very thoughtful questions. Thank you Arthur for organising an interesting assembly for us all to enjoy and learn more! Next week is set to be a busy week, including Open House on Wednesday 6th February. This is when you are invited into the classroom to view your child’s work. Please note that there was an error with the date when published to you last week. Please do ensure that you have the correct date in your diary. I wish you all a lovely weekend and hope the cold and the snow doesn’t interrupt any of your plans.